(July 23, 2018) Aiken Land Conservancy (ALC) proudly announced the power lines along Mead Avenue of Winthrop Polo Field are now buried underground, after two years of a public/private partnership with South Carolina Electric & Gas Company (SCE&G) and the City of Aiken. Burying the power lines will protect the magnificent live oaks that line Mead Avenue from the periodic harsh pruning needed to clear potential obstructions of the over-ground lines and prevent power outages. Aiken Land Conservancy discovered that SCE&G offers a funding share program to cities to underground power lines, a program that has been used by other cities such as Savannah and Mount Pleasant. Past ALC president Larry Comegys spearheaded the effort to bring SCE&G and City of Aiken together in 2016 to begin discussing possibilities. “The City and SCE&G were excited by and committed to the project from the outset,” says Comegys. The program offered by SCE&G is called the Non-Standard Service Fund (NSSF). Funds are credited into the NSSF each year based on a percentage of SCE&G’s electric revenue within the City. The City can access those funds for undergrounding projects by providing a dollar for dollar match. The Aiken Land Conservancy, through the generous donation of Don and Sandy Nicolaisen, owners of the historic Clark Barn adjacent to the field (which is also protected by a conservation easement held by the Land Conservancy), paid half of the City’s matching amount for the project. The other costs for moving the power sources on the polo field to properly irrigate the field was borne by the Land Conservancy. 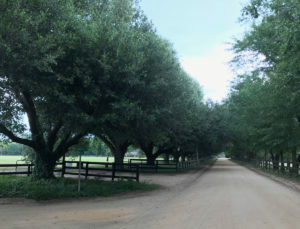 Winthrop Field, which was purchased by the Aiken Land Conservancy in 1998 to save it from future development, continues to be an urban haven in the historic equestrian district for the public, dog-walkers, equestrians, and polo players to this day. The Aiken Land Conservancy and the City, under the leadership of Mayor Rick Osbon, are partnering in the development of an overall tree program to identify ways to improve the care and maintenance of city trees in parkways, along city rights-of-way, and other public places. 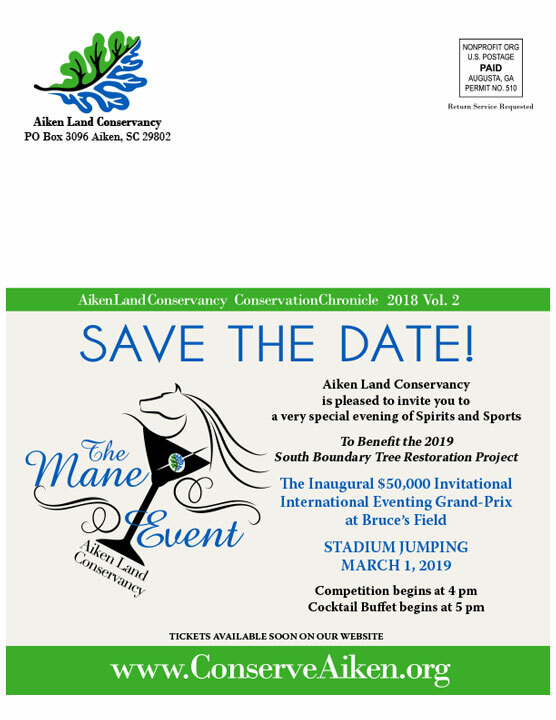 Aiken Land Conservancy is a not-for-profit, §501(c)(3) organization dedicated to protecting and preserving Aiken’s unique natural resources. For more information, visit www.conserveaiken.org.